The Amish craftsmen that build our solid oak TV stand in the wide width, and our oak audio cabinet figured you would like both of them so much that they combined them! 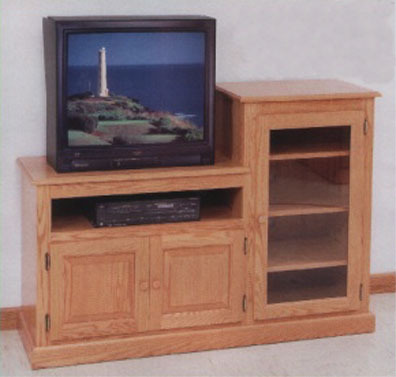 You get the best of both worlds in one solidly built piece of furniture - the wide oak TV stand, and the audio cabinet. Referred to as the #615 high-low entertainment unit, it has all the features of both individual pieces except it does not have the swivel base on the TV stand portion. This is a great way to combine your TV and stereo together if you are on a budget, or don’t have enough room for a full-size Amish entertainment center.